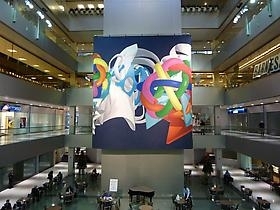 Boston Properties, Inc. (NYSE: BXP) announced today that it has installed a major painting by world renowned artist Frank Stella in the Atrium Shops and Cafes at Lexington Avenue and 53rd Street. The work was acquired with the assistance of Leslie Feely Fine Art, LLC. Originally commissioned as a theater curtain for the Monte Carlo ballet, Les Ballets de Monte-Carlo, the work measures 38 feet high by 65 feet wide, and wraps around the super-column in the Atrium. Based on small-scale interlocking sculptures, the vast canvas conveys a dynamically colorful expressionism while at the same time remaining architectural and geometric. Born in Malden, Massachusetts, in 1936, Frank Stella is one of the most well-regarded post-war American artists still working today. Represented in all the major art museums throughout the world, Stella first gained international attention by being included in the seminal Sixteen Americans exhibition at the Museum of Modern Art, New York, in 1959. He subsequently was given a retrospective at the Museum of Modern of Modern Art in 1970 and then a one man show there in 1987. He has also been the subject of several other retrospectives in the United States, Europe and Japan. Recent solo exhibitions include Frank Stella on the Roof and Frank Stella: Painting into Architecture at the Metropolitan Museum of Art, New York, in 2007. A major five-decade retrospective organized by Michael Auping, chief curator of the Modern Art Museum of Fort Worth, TX, is planned for 2013. The Atrium is open to the public seven days a week from 7am to 12pm. It contains a Hillstone Restaurant, Barnes & Noble, 24 Hour Fitness Derek Jeter Gym, Market Café, Cucina Gourmet, Earth, Piada, and other cafes and shops.